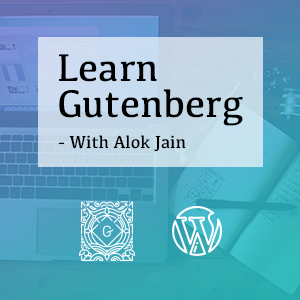 Quick recap: In the previous part of this post, first, we have created a plugin for our Gutenberg Block. Second, installed and configured Webpack and Babel. We are now ready to start writing code for our Gutenberg Blocks. Let’s write the code for our Boilerplate Block. We created a folder named blocks. We will use this folder to organise all the Gutenberg Blocks we are going to create in this plugin. Next, create another folder inside the blocks folder, and name it as boilerplate-block. In this folder, we will add code for our block and its styling. We are creating this folder structure so that we can create individual folders for every block we want to create in this plugin. This will allow us to use the same plugin for creating multiple blocks, keeping the code of each block separate from each other. Later we will be able to simply make a copy of “boilerplate-block” folder to start creating another block in our plugin. Here we will create a new file named boilerplate_block.js. This file will have the code for “Boilerplate Block” that we are trying to build. Note: You can use any name for these files and folders. Just make sure they are easy for you and other developers to recognise later. Note: In addition to creating a simple block, I have used “Template literals” for the text in <p> tags to make it translation ready. It’s always a good idea to make your code translation ready from the beginning. You can read more about registerBlockType() and Internationalization in Gutenberg documentation. Following is a stripped down version of boilerplate_block.js file without Internationalisation code, below. You can compare and understand the difference., and you can use this version for your boilerplate if you do not want to add internationalisation support for your blocks. That’s all we need to do. Run npm run dev command on command prompt to compile the code and build /dist/blocks.build.js file. We need to register and enqueue the script we have created in last step to make this available to WordPress. Create a new file init.php in blocks folder. We will start by adding the security layer as we did in previous file. Next, we need to register and enqueue the script we have created in step 3 and 4 above. Here we are creating a new function gutenberg_boilerplate_assets() and initialising this function via init action hook. Inside this function, I have used wp_register_script() to register the script that we have prepared after processing it via webpack. Note that we have added two dependencies wp-blocks and wp-i18. While registering the script, we have used functions from these dependencies at the top of boilerplate_block.js file. And we have enqueued the script using register_block_type() function, to make it available in Gutenberg editor. Later we will use these functions to register and enqueue CSS files also. Our new “Boilerplate Bock” is ready for testing. Create a new page or post, and try adding a new block. Search for “Boilerplate Block” and select it. Publish or Preview the page, to see the block on Frontend. Congratulations! your new shiny block is working. One last final piece we are missing here is CSS. We will take a look at how to add CSS files in the next part of this series. Get notified when new acticles are published. Alok design digital experiences to help businesses achieve their goals. He is passionate about designing right User Experience for their customers. For over 15 years, he have worked with small startups to mature product teams. Whether it is designing a WordPress product, a frontend experience, WooCommerce, Shopify, he follow the best product development practices for design and code, for desktop or mobile.